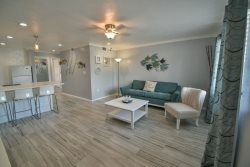 Our ground floor “Sandy Toes” home will have you rested, refreshed, and relaxed. The direct beachfront location allows the splashing waves to lull you to sleep at night and greet you in the morning. Your beachfront patio is a great place for morning coffee or catch a sunset with a cocktail in hand! The spacious interior is fully equipped with everything you could need for a weekend getaway, vacation or an extended winter stay. Upon entry, you are greeted by the spacious kitchen, featuring all the major appliances you would expect in a vacation retreat. The kitchen is fully stocked with plates, cutlery, cookware, kitchen gadgets, and many small appliances. With a split bedroom layout, the guestroom allows for privacy and relaxation. The master, with a queen bed, is gulf front and features an en-suite bathroom with walk-in shower. The secondary bedroom, with a king bed, is serviced by the nearby guest bathroom with a tub/shower combination. The very spacious living room allows plenty of room for the whole gang to gather round for game night or to watch a movie. The living room features a gorgeous fireplace, original hardwood floors and historic detail that you would expect to see in a 100+ year-old home. The adjacent sunroom is a great place to curl up with a book, take a nap, or is a great space to put extra guests on our complimentary Murphy bed. Sunsets and Beach are FREE!